This chapter is about the death and burial of Chief Kinanjui. While you are reading over the comment from the chapter, enjoy some gospel music in Kikuyu. It is a beautiful language. “The road for the last mile was nothing more than a cattle-track over the sward. The grass was grey with dew. Just before we got to the village we had to cross a river-bed with a little winding silvery stream in the middle; here we drove through a white mist. Kinanjui’s big manyatta, when we got up to it, was all quiet under the moon. . .”–excellent description. “Kinanjui’s manyatta was always a lively and noisy place, like a well spouting from the ground and running over on all sides: plans and projects were crossing one another in all directions, and all under the eye of the pompous, benevolent, central figure of Kinanjui. Now the wing of death lay over the manyatta, and like a strong magnet, it had altered the patterns below. . .”–love the “plans and projects were crossing one another”. or the final satisfying completion or achievement of something. p. 349: Spanish flu – from Wikipedia. The 1918 flu pandemic (the Spanish flu) was an influenza pandemic, and the first of the two pandemics involving H1N1 influenza virus (the follow-up was the 2009 flu pandemic). It was an unusually severe and deadly pandemic that spread across the world. Historical and epidemiological data are inadequate to identify the geographic origin. Most victims were healthy young adults, in contrast to most influenza outbreaks, which predominantly affect juvenile, elderly, or weakened patients. The flu pandemic was implicated in the outbreak of encephalitis lethargica in the 1920s. 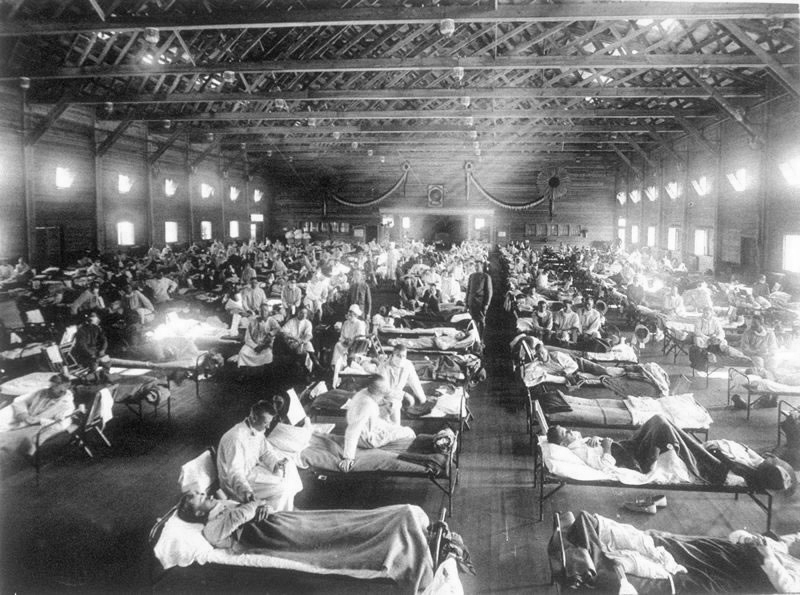 The pandemic lasted from June 1918 to December 1920, spreading even to the Arctic and remote Pacific islands. Between 50 and 100 million died, making it one of the deadliest natural disasters in human history. Even using the lower estimate of 50 million people, 3% of the world’s population (1.86 billion at the time) died of the disease. Some 500 million, or 27% (≈1/4), were infected. Tissue samples from frozen victims were used to reproduce the virus for study. This research concluded, among other things, that the virus kills through a cytokine storm (overreaction of the body’s immune system), which perhaps explains its unusually severe nature and the concentrated age profile of its victims. The strong immune system reactions of young adults ravaged the body, whereas those of the weaker immune systems of children and middle-aged adults resulted in fewer deaths. p. 350:Dagoretti – from Wikipedia. Dagoretti refers to an area in western Nairobi, the capital of Kenya. Administratively it is one of eight divisions of Nairobi. The Dagoretti division is divided into six Locations. The electoral Dagoretti Constituency has the same boundaries as Dagoretti division. Here are a few YouTube videos. The first is a Kikuyu funeral. It is long, and I doubt you want to watch the whole thing, but it does give you an idea of the language and setting. The Soweto people are from Johannesburg, so not exactly near Kenya, howsoever, this is perhaps the best-known, best-loved hymn in the whole world, so I had to include it. The picture never changes, just enjoy the words. The flu sure was awful!!! !